Reference number for this case: 9-oct-54-Briatexte. Thank you for including this reference number in any correspondence with me regarding this case. A resident of Briatexte encounters a flying saucer and its two occupants whom he nearly crushed with his car. Briatexte. -- Saturday evening, October 9, at 08:30 p.m., while returning from Toulouse, Mr. Jean-Pierre Mitto, technician at the Analgic company - currently exposing at the Domestic Arts in Toulouse - and his two cousins, saw in the locality "La Caïffe", on main road RN 631, at at one hour from briatexte (the Tarn) a flying saucer and its passengers. "As I do every evening after the closing of my stand, I returned to my parents' in Briatexte, and that day, by mere chance, I took along my two cousins. I drove at a quite good pace when, after the contour of "La Caïffe", my cousins and I distinguished two small characters - the size of children from 11 to 12 years old - crossing the road within four or five meters in front of the car and which jumped in the meadow. Instinctively, I slowed down and stopped twenty meters further. Just in the time to get out, we saw a large half-spherical disc rounded at the base, of a diameter of six meters approximately, flying away vertically. The machine of red-orange color, seemed to be sucked up, puffed up, and disappeared in the sky like a Bengal fierwork. We had just the time to follow it with the eyes." At our last question, Mr. Mitto told us: "Believe that it is not an hallucination: we really lived it, and in all objectivity, you can publish what I have just told you." 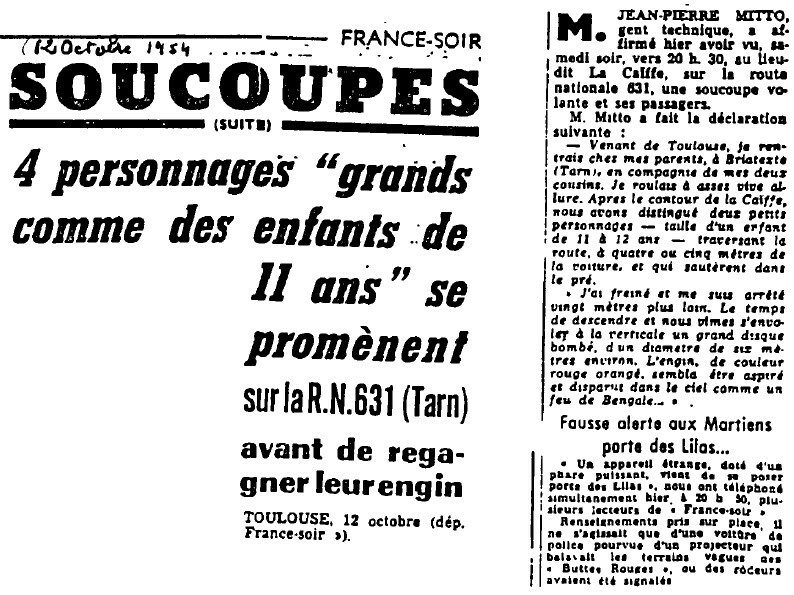 4 characters tall "like 11-year-old children"
TOULOUSE, October 12 ("France-Soir" newsbrief). Mr. JEAN-PIERRE MITTO, technician, affirmed yesterday to have seen, Saturday evening, around 8:30 p.m., at the location called La Caiffe, on the road RN 631, a flying saucer and its passengers. - Coming from Toulouse, I returned at my parents', in Briatexte (Tarn), in company of my two cousins. I drove quite fast. After the contour of La Caiffe, we distinguished two small characters - the size of a child from 11 to 12 years old - crossing the road, at four or five meters before the car, and which jumped in the meadow. "I slowed down and stopped twenty meters further. The time to go down and we saw flying away at the vertical a large convex disc, of a diameter of six meters approximately. The machine, of red orange color, seemed to be sucked up and disappeared in the sky like a fireworks." A strange apparatus, equipped with a powerful headlight, has just landed Porte des Lilas," several readers of "France-Soir" phoned us simultaneously yesterday, at 08:30 p.m..
Information taken on the spot, it was actually a police car equipped with a projector which swept the vacant sites of the "Collines Rouges", where vagabonds had been reported. And here are the "Martian girls"! Paris. -- The saucers are inhabited: dozens of french people say so, and the descriptions roughly match: small hairy men, not mean, but using an incomprehensible language and gifted with an uncommon talent for escaping. Here is now the visit that everybody hoped for: that of the Martian girls. Mr. Martin had the pleasure to be the first to welcome them. Mr. Martin is currently on vacation on the Oléron island. He is resting, contemplating the waves and the pine rees forest, from the heavy climate of Africa under which he teaches the little black kids to read and write. Hiking is his favorite passtime. The walk he made on Monday will surely stay in his memory. At the turn of the path that smelled a good autumn air, he saw two pretty girls he identified as Martian. They were about 1m70, were wearing boots, glove and had leather helmets. Mr. Martin, barely recovering from his surpize, wanted to start a conservation, but failed to be understood. Then the two Martians grabbed his pen and his notebook to trace signs that were incomprehensible all the same. Apart from that, the descriptions of the last twenty-four hours are really lacking originality. Let's note all the same the testimony of Mr. Jean-Pierre Mitto, technical agent. "Coming back from Toulouse with two relatives, he said, I suddenly distinguished in the beam of my headlights two small beings who crossed the road only a few meters above my car, I immediately stopped and, to our great amazement, we saw a big red disc take off from a nearby meadow, of a six meters diameter approximately, rising vertically. The craft disappeared in the sky in a few seconds." The cigar of Bompas (Pyrénées Orientales) spread a commotion in the village, because it landed in the middle of the street, at midnight, however. It is the country's baker, Me. Sebelli, who saws this. In the Aveyron, three hunters followed, above Gaillac, the moves of a two meters long cigar; which followed in the sky a series of big "S". Each move was made with a noise comparable to a stream of vapor under pressure. Three balls of fire and a red cigar disturbed the night patrol of two police officers of Riom, Roger Thévenin and Albert Daury, and a luminous disc moving at 800 meters of altitude approximately interrupted the travel of two butchers of Melun, who came out of the car to better see the the phenomenon. ALBI, October 12. -- A car driver from Briatexte (Tarn), M. Jean-Pierre Mitto, technical agent in a company currently exposing at the "Household Arts" of Toulouse, said he met in the dark, on the national road No. 631, the passengers of a flying saucer. "Returning to Toulouse, with two parents, he said, I suddenly distinguished in the beam of my headlights, two little people who crossed the road, a few meters away from my car. I stopped immediately and, to our amazement, we then saw from a nearby meadow a large red disk with a diameter of 6 meters, fly away, rising vertically. The craft disappeared into the sky in a few seconds". MULHOUSE. -- Having seen this evening a light in a pasture, two young girls of Heimersdorf, Anny and Roselyne Pracht aged 22 and 18, came closer thinking it was a fire lit by a shepherd. Then they saw, they claim, a craft of a height of about 2 meters. At their approach, the barrel-shaped craft turned to a glowing red, rose into the air and disappeared over the horizon. The same phenomenon was observed by two other people. MELUN. -- Mr. Jules Lefranc, bank employee, Paris resident, saw in the sky, near the François - de - Tessart stadium in Meaux, for about three minutes, an object brightly lit from the inside that, he said, was shaped like a small soccer ball. This craft disappeared while leaving behind, the witness said, a luminous trail of the size of a stovepipe. Residents of Trilport reportedly saw an identical craft motionless. A car driver has "seen" the passengers of a "saucer"
ALBI. -- A motorist of Briatexte (Tarn), Mr. Jean-Pierre Mitto, technician in a company currently exposing at the "domestic Arts" of Toulouse, stated to have encountered, at nightfall, on national road N.631, the passengers of a flying saucer. "Returning from Toulouse, in company of two parents", he said, "I suddenly distinguished in the beam from my headlights two small characters who crossed the road, within a few meters hardly of my car. I stopped at once and, to our great amazement, we then saw take off from a nearby meadow a large red disc of a diameter of about 6 meters, going up vertically. The machine disappeared in the sky in a few seconds." BOMBAY. -. Several people claim to have seen flying saucers above Bombay during the last days. Mr. G Joshi, among others, businessman, stated to have seen, last Thursday at midnight, a luminous disc flying at a terrifying speed, from the South in North. He specified that the machine was roughly a foot in diameter and that its center was dark, but that its periphery was luminous. The "flying saucer" crossed the sky without noise nor emitting of smoke. Mr. Michael Jacob, studying with the college of Bombay, also claimed to have seen a flying saucer. The description that he gave of the machine is very similar to that provided by Mr. Joshi. A motorist of Briatexte (the Tarn), Mr. Jean-Pierre Mitto, technician in a company currently exposing at the "domestic Arts" of Toulouse, stated to have encountered, at nightfall, on national road N.631, the passengers of a flying saucer. The Civilian Association for research on the flying saucers recorded 70 new memberships since the beginning of the year. Mr. H.H. Fulton, président of the Association, declared during his Congress that the number of the "unidentified flying objects" located in the sky of New Zealand this year, is higher than that of the previous years. In the scientific world, he stated, an unquestionable tendency takes shape that admits that the saucers are craft probably coming from other planets. Before flying away into their saucer! After having brought us giant "Martian" women, now the flying saucers begin to transport Lilliputians who carry out reconnaissance patrols on the national roads. This new variety of "interplanetary humans" is revealed to us by Mr. Jean-Pierre Mitto, technical agent, who claims to have seen, Saturday evening around 8:30 p.m., the passengers of a saucer cross National Road 631 at the place called "La Caiffe". Stopped by a ray of light! - I was driving in the middle of the road, not far from Clamecy, when I felt the electric shock. The engine stopped and the headlights went out. Suddenly I saw in a meadow a machine of cylindrical shape of a rather large diameter. I saw clearly around this apparatus three little beings who moved rapidly. The appearance lasted only a few seconds, but it was very clear and no doubt is possible. Mr. Vigneron confirmed what Mr. Gallois said. A motorist of Briatexte (Tarn), Mr. Jean Pierre Mitto, technician in a company currently exposing at the Domestic Arts of Toulouse stated to have met at the fall of the night, on national road N.631, the passengers of a flying saucer. "Returning from Toulouse in company of two relatives," he said, "I suddenly distinguished in the beam of my headlights two small characters who crossed the road at hardly a few meters of my car. I stopped at once and, to our great astonishment, we then saw flying away of a nearby meadow a large red disc of a diameter of six meters approximately, going up vertically. The machine disappeared in the sky in a few seconds. A newspaper of Toulouse specifies that Saturday evening, October 9, at 08:30 p.m., while returning from Toulouse, Mr. Jean-Pierre Mitto, technician at the Analgic company - exposing at the Domestic Arts in Toulouse - and his two cousins, saw at the locality "La Caïffe", on main road RN 631, at one hour of Briatexte, a flying saucer and its passengers. Here is the account made by Mr. Mitto: "I was returned to my parents' in Briatexte and, that day, I took along my two cousins. I drove at a rather fast pace when, after the contour of "La Caïffe", we distinguished two small characters - the size of children from 11 to 12 years old - crossing the road within 4 or 5 meters in front of the car and who jumped in the meadow. Just in the time to get out, we saw a large half-spherical disc, rounded at the base, of a diameter of 6 m approximately flying away vertically. The machine, of red-orange color, seemed to be sucked, puffed up, and disappeared in the sky like a Bengal firework. We had just time to follow it with the eyes a few seconds." Will we know what occurs or will it be necessary to give the instruction to capture a "small Martian" with the lasso? 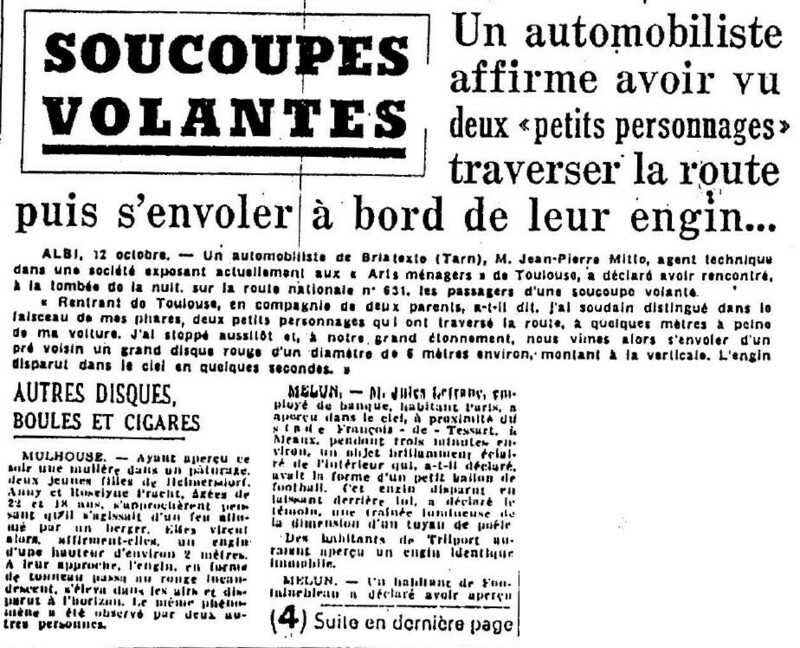 The author indicates that in the evening of October 9, 1954, Jean-Pierre Mitto, engineer from Briatexte, in the Tarn, returned home by car with two of his cousins, when he distinguished in front of him on the road two small silhouettes running away. He braked and saw in a meadow a discoïdal craft, approximately 6 meters in diameter, with a hemispherical dome and the "creatures", which had the size of a child from ten to twelve, ran as fast as possible to the craft. When the creatures were on board machine, it took off. The author indicates that in the evening of October 7, 1954, a motorist returning from Toulouse in company of two parents distinguished in the beam from his headlights two small beings which crossed the road. He stopped at once and to their great astonishment they saw flying away from a nearby meadow a large red disc approximately 6 meters in diameter which rose vertically and disappeared at once. "... I suddenly distinguished, as the two cousins who accompanied me also did, two small beings of the size of a child from eleven to twelve years old crossing the road in the gleam of my headlights. I stopped at once. In the time to go out, we saw a red luminous disc flying away vertically from the nearby meadow, which disappeared in the sky in a few seconds." Aimé Michel reports that an investigation was carried out by lieutenant Fayer of the gendarmerie and adjudant Vergne, with a reconstitution on the spot. Mr. Mitto specified to them that the machine had left the ground at a high climbing speed by sucking the air under it. At the place where Mr. Mitto indicated that the disc was posed, odd brownish stains of a viscous material were found. The investigators also discovered that at the time of the sighting as indicated by Mr. Mitto, another witness, Mr. Barthe, whose smallholding is in the vicinity of the crossroads of Caïffe, had seen a luminous object in the precise direction where the landing had occurred, which rose at a sharp pace and quickly disappeared at high altitude. Michel Carrouges lists as a case with small occupants but lacking details that with Mr. Mitto as witness, near Briatexte in the Tarn, on October 9, 1954. He notes that Mr. Mitto has only seen two small being crossing the road, without being able to detail them, and that even the saucer was not seen well. Further in his book, Carrouges tells of the mystifications of two journalists of the Samedi-Soir weekly newspaper, according to their articles in this newspaper from October 21 to 27, 1954: these journalists left Paris by car, and went in the South, the areas of Cahors, Montauban and Toulouse, equipped with accessories such as divin suits, fireworks and various products of pyrotechnics, to play Martians. The journalists concluded that all testimonys of flying saucers are stupidities and especially the testimonys of October 13, 1954, one by "Mr. Ott in Toulouse", anoother by Mr. Carcenac in Graulhet, in the Tarn and also that of Mr. Mitto on October 9 in the Tarn, but without naming him. Carrouges considers it regrettable that what could have been an interesting experiment on the psychology of perception turned into a joke, and that the roads that they followed was given only very partially, the journalists not having specified any date. He also specifies that they actually did not give any proof of their effective passage in the localities they claim to have been in and, ultimately, it is not so outrageous to even wonder whether their reports were not completely made up. He notes all the same that there are some photographs of witnesses whose good faith was fooled by the journalists in the articles and that it seems difficult that they were invented; that it can thus be admitted these journalists actually operated a round of hoaxes, but that its importance, the precise places and the exact hours are so lacunar that nothing certain can be concluded form the whole. Michel Carrouges reconstitutes that they have apparently followed the road of Brive, Cahors, Montauban, Toulouse, stopping their car and putting on their disguise and shooting earthly fireworks from time to time at the following places: Pouzergues (in the south of Cahors), Varreye (on the road of Montpezat de Quercy), Montalzet (on main road 20), Saint-Gomhiez (between Fronton and Bouloc, on secondary road 4), from there, or from near there, they made a turn towards Graulhet, then returned at the entry of Toulouse, near the Blagnac airfield, and that thus any testimony on this route, and at this time, is suspect to be illusory. Among the cases ascribable to the journalists-pranksters, Carrouges indicates that in the case of Briatexte, it is not totally obvious that this explanation should be accepted for sure, for the observation of Mr. Mitto who stated to have seen at approximately 08:30 p.m., two small pilots cross the road in front of his car, and then a large red disc disappearing in the sky. He alerts that, if this incident is really dated from October 9, as according to Aimé Michel, page 264, it seems then relatively too old, as it is not very likely that the pranksters made two trips to the Tarn and spent five days staying in the area. Oct. 09, 1954, 08:30 P.M., Briatexte (France). On Route N631 at "La Caiffe," a technician, J. P. Mitto, was coming back from Toulouse with two other persons when they saw two small figures, the height of 11-year-old children, cross the road about 5 m in front of the car and jump into a pasture. Stopping immediately, the witnesess saw a large convex disk take off vertically. It was about 6 m in diameter, orange in color and was literally "sucked up" into the sky. Brown oily spots were found at the site. (Sud-Ouest, 9 oct. 1954, Paris-Presse, Le Figaro, 13 oct. 1954) (43, 50). M Jean-Pierre Mitto of Toulouse, technical representative for an industrial firm, was driving at considerable speed along Route N-631 near Briatexte, when "I suddenly caught sight - as did my two cousins who were with me - of two small creatures, the size of children of eleven or twelve, who were crossing the road in front of my car. I stopped instantly. But before we had time to get out we saw a red glowing disc taking off straight from the meadow next to us, and saw it disappear in the sky a few seconds later." In the course of the police enquiry conducted on this case, M Mitto emphasised that the machine had left the ground at a tremendous rate of ascent, sucking the air up from beneath it in the process. At the place in the meadow where he said the machine had rested, the police found brownish spots of some unfamiliar viscous matter. "I was returning from Toulouse to my parents' house in Briatexte and I was with two cousins. After the turning of Caiffe, we saw two small forms of the size of a child age 11 or 12 crossing the road at some 5 meters in front of the car; they leaped in a pasture. I applied the brakes and stopped approximately 20 meters further. We had hardly left the car that we saw a large convex disc flying away vertically." "It was approximately 6 meters in diameter, was of orange color, and it was literally "sucked" in the sky." The two authors indicate that in Briatexte in the Tarn, on October 9, 1954, around 6 p.m., according to a dispatch of the A.F.P. and their personal files, a motorist of Briatexte, Jean-Pierre Mitto, technician in an industrial company, drove on the R.N. 631 road with two of his cousins on board the car. "Surprised, I stopped at once. To our great amazement, we saw a large red disc flying away, of approximately 6 meters in diameter. The machine flw away vertically, and it disappeared in a few seconds." The authors point out that in his book " Mysterieux Objets Célestes", Aimé Michel reports that at the time of the investigation carried out by Lieutenant Fayet of the gendarmerie and Adjudant Vergne, Mr. Mitto had specified that the craft machine had left the ground at a very high climbing speed "while sucking the air under it." At the place in the meadow indicated by Mr. Mitto as being that where the machine had been posed, the investigators found strange and slightly viscous brownish spots. "I returned from Toulouse when, at the crossroads of La Caiffe, towards 08:30 p.m., my road was cut by two figures of small size. I took them for children and braked to scold them for their imprudence. Two of my cousins were with me in the car. We hardly had the time to go down that already a large disc of a diameter of 6 meters approximately flew away in which, incontestably, the two unknowns had taken seat. The apparatus left the ground with a very high climbing speed sucking the air below. We managed to follow it with the eyes during ten seconds." "- Such are the facts, without ornament, which decided the gendarmerie to investigate. In front of Misters Favet leutenant in Lavaur, and Vergne, adjudant in Graulhet, Mr. Mitto maintained his statements during what could be called a reconstitution." "Mr. Mitto however thinks that the two characters that he almost ran over are not by no means "Martians" but indeed residents of the Earth. According to him the saucer must be propelled by a force of atomic origin." "During the reconstitution Mr. Alousqué discovered in the meadow brownish spots (perhaps oil stains) at the place where Mr. Mitto roughly locates the take-off of the saucer." "In addition Mr. Barthe, whose farm is close to the crossroads of la Caiffe is said to have seen, at the hour indicated by Mr. Mitto, an unknown apparatus which left the ground and flew away very high in the sky." The authors regret that Jacques Vallée makes brief summaries, and indicates that the case formed part of a series of mystifications by two journalists of the weekly magazine "Samedi-soir", Michel Agnellet and Pierre Laforêt. "We also took along in our luggage complete equipment of bomb disposal expert: eighteen Bengal fireworks, reds, greens and white, forty Roman candles, true Martians guns launching green or red small balls of fire at fifteen meters around... and in silence. We had also taken some twenty flying rockets, able to spring up to a hundred or hundred fifty meters, to explode in gigantic umbrella of fire. Prosaically we bought this material at the market of Brives-la-Gaillarde, where the local fireworks expert, Mr Forêt, had guaranteed to us the exceptional quality of these devices..."
The authors specify that an article in Samedi-soir for the week of October 21-27, 1954, with photographs, displayed the whole series of the journalists's hoaxes. The authors add that they had a talk with Mr. Mitto who affirmed to them that he "had never granted great credit to this story and that he had believed it was a kids' prank." "We, were the Martians." This headline has just concluded a serie of hoaxes perpretrated by two Parisian reporters, Mr. Michel Agnelet and Mr. Pierre Laforêt. The two authors indicate that in Briatexte in the Tarn on October 9, 1954 at 08:30 p.m., Jean-Pierre Mitto, technician in an industrial company is with two of his cousins. He drives on National Road N631. While arriving at the locality "Caiffé", they distinguish, in the beams of the headlights, two small characters of the size of an eleven year old child who cross the road at a few five meters in front of the car, and which leap in a pasture. The driver applies the brakes and stops twenty meters further. Hardly had they left the car, that three witnesses observe the departure of a large red-orange disc of approximately six meters in diameter, at high speed, like literally "sucked up" in the sky (according to Vallée and Bowen) or by sucking the air under it (according to Michel). The authors indicate that the case was asserted "with weak conviction" by two journalists who had been organizing a series of hoaxes in the area but 4 days later, whereas the date of October 9 is certain. They note that Lieutenant Fayet and Adjudant Vergne of the national gendarmerie investigated and discovered brownish stains of a viscous liquid at the place indicated by the witness. The authors indicate that the sources are Aimé Michel in "A Propos des S.V." pages 193-194; C. Garreau and R. Lavier in "Face aux ET" page 162: Quincy; Jimmy Guieu in "Black Out sur les S.V." page 199; Dauphiné Libéré for October 12, 1954; Le Provençal for October 13, 1954; Le Figaro for October 13, 1954; Michel Carrouges in "Les Apparitions de Martiens" page 166; La Croix for October 14, 1954; Samedi-Soir for the week from October 21-27, 1954. The ufologist notes in his listing that the case of Briatexte on October 9, 1954 is explained: the witnesses were victims of one of the prankss organized by the journalists of Samedi-soir. Figuet notes that the source is "B. B. p. 93 to 96." The author indicates that on October 9, 1954, at 08:30 p.m., in Briatexte, in the Tarn, Jean-Pierre Mitto, his two anonymous cousins, saw in the headlights of the car where they were, at the locality La Caiffé, two small characters of the size of an eleven year old child which cross the road in front of their vehicle to slip by in a close pasture. Mr. Mitto slowed down brutally, and the three witnesses descended to attend the departure of a large orange red disc. Another witness, Mr. Barthe, who resided near the place, saw the luminous apparatus rising at sharp pace at high altitude according to a second source. Jean Sider notes that Figuet evokes the hoaxes of two Parisian journalists who would have perpetrated mystifications in the area at the same time, but he estimates that they are "alleged" hoaxes, and notes that for this case Figuet did not print this explanation like he did for other CE3 cases. When a few years later, Figuet "developed the syndrome of the 'socio-psychology'", he "hastened to give a contrary opinion." Jean Sider gives as sources "Figuet, p. 139; Michel, p. 194." The Belgian ufologist indicates in her catalogue that in 1954, on October 9, in France in Briatexte in the Tarn, "Towards 20:30, on main road 631, in Caiffe, J.P. Mitto returned from Toulouse with two other people when they saw two small beings, of the size of an eleven-year-old child, which crossed the road, at 5 m approximately in front of the car, then jumped in a meadow. Stopping, the witnesses immediately saw a large convex disc rise vertically. It was approximately 6 m in diameter, was of orange color and was literally sucked in the sky. There were brown and oily spots on its site." The sources are indicated as "Sud-Ouest, 9 Oct 1954, Paris-Presse, Le Figaro, 13 Oct 1954" and "Jacques Vallée: 'Chronique des apparitions ET' - DENOEL 1972 - J'AI LU COLL. - p. 274". She adds: "IN REALITY: 'We were the Martians' This headline had just concluded a series of hoaxes organized by two Parisian journalists, Misters Michel Agnelet and Pierre Laforêt. (...)"
The source for this is indicated as "Erich ZURCHER: 'Les apparitions d'Humanoïdes' - éd. Alain Lefeuvre 1979, p. 179 et 181". Jean Pierre Mitto was driving near Briatexte with his 2 cousins when they perceived 2 small beings the size of 11 or 12-year-old children crossing the road in front of the car; he braked to a stop. Immediately they saw a red glowing disc rise straight up into the sky from an adjoining field. Traces were found. 10/09/54 2030 France, Briatexte: Jean Pierre Mitto was driving with two cousins when they saw two small beings the size of 11 or 12- year-old children crossing the road 25 ft ahead of the car. The witness stopped the car and they saw a red glowing disc ascend vertically from a field. The object was about 22 ft in diameter. A brown, oily residue was found at the site. Didier Gomez indicates that on October 9, 1954, at 08:30 p.m., two humanoids flew away in a flying craft at the locality La Caïphe, in Puybegon close to Briatexte, and that the case was published in national newspapers with different and evocative headlines. Gomez indicates that the case is to his knowledge the only one in the department of Tarn in 1954 and without any doubt one of most extraordinary which is to be studied. "A saucer and two little men" in "La Liberté de l'Est"
"A car driver of the Tarn saw two 'Martians'" in "La Croix", "Paris Normandie"
He notes that other sources are "Black-out sur les soucoupes volantes" by Jimmy Guieu, Fleuve Noir publisher, 1956; "Ovni le premier dossier complet des rencontres rapprochées en France" by Figuet and Ruchon, Alain Lefeuvre, publishers, 1979, p. 138, and the "Sud-Ouest" newspaper for October 9, 1954 and "Paris Normandie", "Paris Presse", "Le Figaro", "Liberté de l'Est", "La Croix" for Wednesday, October 13, 1954. "Albi - a motorist of Briatexte (Tarn), Mr. Jean-Pierre Mitto, technician in a company currently on display at the "domestic arts" of Toulouse stated to have met, at nightfall, on the RN 631, the passengers of a flying saucer. "Returning from Toulouse, in company of two relatives", he says, "I suddenly distinguished in the beam of my headlights two small figures who crossed the road, at a few meters hardly from my car. i stopped at once and, to our great astonishment, we then saw flying away from a nearby meadow a large red disc of a diameter of 6 meters approximately. The craft disappeared in the sky in a few seconds". He indicates that starting from these first data he did a search to find the three witnesses, and that "many things were sais on this case, even the claim in several ufological works that all this business was only a hoax by two journalists at that time, thus throwing discredit upon the initial testimony, in spite of overwhelming proof." He notes as "overwhelmong proof" that the observation is done "under very good conditions" and that traces were found in the field from where the machine flew away, and that all this was confirmed in writing on the gendarmerie report. He explains that name of the witness "Mitto" by "strange coincidence" undoubtedly encouraged "some with not very scrupulous behavior" to link the case with mythomany and to make fun of "the one who saw the Martians", because often when a case is extraordinary, and moreover with a humanoid encounter, it is easier to cast doubt than to try to understand why the witness had an urge to tell what he had seen. Didier Gomez indicates that this bad publicity followed the witness throughout his life and that even today he does not wish any more to mention this story. He tried to contact him by several letters, but in vain, and learned by a person from his entourage who knows him personally that he did not wish any more to talk again of this adventure because of the concern that it caused throughout his life. Didier Gomez ensures that all the facts that were published at the time "are held for truths" and that the witness maintains word for word all that is described in the press and that he did not find any explanation. "At the time of the investigation carried out by Lieutenant Fayet of the gendarmerie and Adjudant Alder, Mr. Mitto specified that the craft had left the ground at a high climbing speed by sucking air under it. A reconstitution was made on the spot. At the place of the meadow indicated by Mr. Mitto as being where the craft had been posed, odd brownish stains made of a viscous material were found, a detail already observed. Last precision by the investigators: at the hour indicated by Mr. Mitto, Mr. Barthe, whose samll farm is close to the crossroads of La Caïffe, had seen a luminous object rising at sharp pace in the direction where the landing had precisely occurred, and disappearing quickly at high altitude." "At that time, two journalists of "Samedi-soir", Michel Agnellet and Pierre Laforet, left Paris, went in the area of Cahors, Montauban and Toulouse. They had accessories such as various outfits, fireworks and various fireworks products to play "the extraterrestrials". But it does not seem that they pushed their course on N 631. On the other hand, their road, quoted in the book by Michel Carrouges "Les Apparitions de Martiens", p. 164, does go by by Briatexte." "Left by car Paris, went in the South, area of Cahors, Montauban and Toulouse (.) They formed as conclusion the general inanity of the testimonys on the flying saucers, dating from October 13, 1954 and relating to one Mr. Ott in Toulouse [not Toulouse, but near Mulhouse! ], another Mr. Carcenac in Graulhet, in the Tarn. They conclude in the same direction about Mr. Mitto (incident of October 9), but without naming him. This prank could have brought a very rich whole of personality tests on human testimonys in connection with saucers. But the followed route is given only very partially and the reporters did not specify any date. Zero proof is brought besides, about the effective passing of these reporters in the localities in question and, in extreme cases, one would even be right to wonder whether the report were not entirely invented. It would be but one more mystification. There are admittedly photographs of witnesses whose good faith was surprised and it appears difficult that they were invented; one can thus admit that the aforementioned reporters actually operated a round of mystifications but how broad it was, at which precise location, at what exact time, there remains too much gaps so that one cannot know with certainty." Didier Gomez says that he much agreeswith Michel Carrouges' opinion, when he says that this report had as only as avowed purpose to mystify the entire testimonies collected that October 1954, and that its goal seems to be partially reached indeed, but that "Nevertheless, too much unsaid on behalf of these two journalists make it possible to express the greatest doubt on their possible hoaxes" and that starting from a case in Graulhet on October 13, 1954 "the generalization is easy." Didier Gomez indicates that it is extremely likely that to shut down the popular rumour "about these damned saucers, this Parisian raid was used to elucidate various regional cases which caused many wondering" and that it is established that the two journalists passed by Briatexte but that they did perhaps not stop there, this on October 13 and not 9. He adds that the article published on October 22, 1954 in the newspaper "Le Soir", of Brussels, headlined "When two journalists play 'Martians' close to Toulouse" does not say anything either about the course carried out by the two Parisian, nor the dates of their misdeeds and that we only learn in there that they "were equipped with fireworks accessories", and that they had been "by night naturally in front of various isolated farms." Didier Gomez indicates that "In front of so many uncertainties", he prefers to "stick to the initial testimony and information" that he managed to get in March 2003 from the mouth of second hand witnesses, whom he interviewed in the surroundings of Graulhet and Briatexte, who assure him that it was according to them a totally real case. He comments on that he thus has the feeling that "certain people" could be deceived by an explanation which "altogether, pleased the readers at the time well" and that it seems to him that "much too many elements give to this case a sufficient character of strangeness so that it cannot be explianed by such a coarse explanation by a hoax" for there are "traces noted on the ground", charred grass, "which are not contestable even if they could have been easily reproducible by merry pranksters" and that "what about our two humanoids which fly away on board a large orange red disc of of six meters in diameter!!!" He then tells that to try to sort things out he contacted the main witness by telephone and discussed with his wife on March 28, 2003, who acknowledged to him that the health of her husband was diminishing day by day and that his memory started to be cruelly lacking, and she firmly asked him to not bother them with this story, and that he thus could not meet the witness. He adds that the couple resided at that time in Paris, and that it is while going to his parents in Briatexte that the witness had made this observation in company of two of his cousins, completely by chance. Perhaps the cousins still reside in the Paris area but Mrs. "Mitto" acknowledged on the phone on April 1, 2003 to have lost any trace of them since a long time, and it was thus difficult to further investigate without causing damage to the integrity of the witness. Didier Gomez specifies that the place of observation is on the community of Puybegon at the doors of Briatexte but not at an hour of road like written in the article of Le Tarn Libre, that the locality La Caïphe is in fact 200 meters from the entry of the community of Briatexte when one arrives by the D 631 road coming from Toulouse, and that the place is thus close to Briatexte and not Briatexte itslef as all the books referring to the case except very rare exception are claiming. He specifies that the name "Mitto" is erroneous, but that he does not want to give the true name since he is still alive in March 2003, 85 years old, and that he does not want to talk any more about the case. He concludes that to think that this case is a minsinterpretation is "quite pretentious and very superficial" "whereas the investigators (of poor level in fact) did not even take the trouble to rectify these small errors of the time, which shows a definite lack of serious." 1954 - Briatexte, France. At 8:30 p.m. on Route N631 at "La Caiffe," a technician named J. P. Mitto was returning from Toulouse with two other friends when they saw two small figures cross the road in front of their car and jump into a pasture. The beings were about the height of 11-year-old children and crossed only five meters in front of them. Stopping immediately, the witnesses saw a large convex disc take off vertically. It was about six meters in diameter, orange in color, and was literally "sucked up" into the sky. Brown oily spots were found at the landing site. (Source: Jacques Vallee, Passport to Magonia, p. 222). 10/09/54 2030 France, Briatexte: Jean Pierre Mitto was driving with two cousins when they saw two small beings the size of 11 or 12- year-old children crossing the road 25 ft ahead of the car. The witness stopped the car and they saw a red glowing disc ascend vertically from a field. The object was about 22 ft in diameter. A brown, oily residue was found at the site. 20:30 In Briatexte (Tarn, France), on the N631, in Caiffe, a technician, J.-P. Mitto, returns from Toulouse with 2 other people when they see 2 small beings, of the size of a 11 year old child, who crosses the road, at 5 m approximately in front of the car, then jumps in a meadow. Stopping immediately, the witnesses see a large convex disc rising vertically. It is approximately 6 m in diameter, it is of orange color and was literally "sucked" in the sky. There are brown and oily spots on its site. The sources are indicated as "Sud-Ouest, October 9, 1954" and "Paris-Presse, Le Figaro, October 13, 1954". On 9 October 1954, at Briatexte in the Tarn, another 6m diameter disc let brown and oily stains. Luc Chastan indicates in his database that in the Tarn in Briatexte on October 9, 1954 at 20:30 hours, "the main witness, technician in an industrial company is in company of two of his cousins. He drives on N631. While arriving at the locality 'Caiffé' they distinguish, in the beams of the headlights, two small characters of the size of an eleven years old child who cross the road at a few five meters in front of the car and who leap in a pasture." "The driver applies the brakes and stops twenty meters further. Hardly out of the car, the three witnesses observe the departure of a large red-orange disc approximately six meters in diameter, at high speed, like literally 'sucked' in the sky (according to Vallée and Bowen) or by sucking the air below (Michel)." "This case was asserted 'mildly' by two journalists who were performing a series of hoax in the area but 4 later, however the date of the 9th is certain." The website indicates that on 9 October 1954, at 20:30, in Briatexte, France, "Large orange convex disk, six meters in diameter, and two small figures, the height of 11-year-old children." The website adds: "Briatexte, France . At 8:30 p.m. on Route N631 at 'La Caiffe,' a technician named J. P. Mitto was returning from Toulouse with two other friends when they saw two small figures cross the road in front of their car and jump into a pasture. The beings were about the height of 11-year-old children and crossed only five meters in front of them. Stopping immediately, the witnesses saw a large convex disc take off vertically. It was about six meters in diameter, orange in color, and was literally 'sucked up' into the sky. Brown oily spots were found at the landing site." And: "On Route N631 at "La Caiffe," a technician, J. P. Mitto, was coming back from Toulouse with two other persons when they saw two small figures, the height of 11-year-old children, cross the road about five meters in front of the car and jump into a pasture. Stopping immediately, the witnesses saw a large convex disk take off vertically. It was about six meters in diameter, orange in color and was literally "sucked up" into the sky. Brown oily spots were found at the site." And: "An object was observed. Traces found. One orange-blue saucer, about 20 feet across, about twenty feet away, was observed by three male witnesses on a highway for two minutes. No sound was heard. Two 3.5-foot-tall dwarves were seen." And: "Jean Pierre Mitto was driving near Briatexte with his 2 cousins when they perceived 2 small beings the size of 11 or 12-year-old children crossing the road in front of the car; he braked to a stop. Immediately they saw a red glowing disc rise straight up into the sky from an adjoining field. Traces were found." The sources are indicated as Webb, David, HUMCAT: Catalogue of Humanoid Reports; Guieu, Jimmy, Flying Saucers Come from Another World, Citadel, New York, 1956; Michel, Aime, Flying Saucers and the Straight-Line Mystery, S. G. Phillips, New York, 1958; Bowen, Charles, The Humanoids: FSR Special Edition No. 1, FSR, London, 1966; Pereira, Jader U., Les Extra-Terrestres, Phenomenes Spatiaux, Paris, 1974; Vallee, Jacques, Computerized Catalog (N = 3073); Vallee, Jacques, Challenge to Science: The UFO Enigma, Henry Regnery, Chicago, 1966; Vallee, Jacques, Preliminary Catalog (N = 500), (in JVallee01); Vallee, Jacques, A Century of Landings (N = 923), (in JVallee04), Chicago, 1969; Cramp, Leonard G., Piece for a Jig-Saw, Somerton, Isle of Wight, 1966; Schoenherr, Luis, Computerized Catalog (N = 3173); Carrouges, Michel, Les Apparitions de Martiens, Fayard, Paris, 1963; Hall, Richard H., The UFO Evidence, NICAP, Washington, 1964; Olsen, Thomas M., The Reference for Outstanding UFO Sighting Reports, UFOIRC, Riderwood, 1966; Phillips, Ted R., Ted Phillips investigation files; Phillips, Ted R., Physical Traces Associated with UFO Sightings, CUFOS, Chicago, 1975; Delaire, J. Bernard, UFO Register Volume 7 (1976), Data Research, Oxford, 1976; Hatch, Larry, *U* computer database, Author, Redwood City, 2002; Rosales, Albert, Humanoid Sighting Reports Database. Vallee Case 222, citing Paris-Presse + Figaro 13 October 1954 + Sud-Ouest 9 October 1954. The author indicates that there was a close encounter of the 3rd kind in Briatexte, at the locality "La Caiffé", in the Tarn, on October 9, 1954, at 08:30 p.m..
Mr. Jean-Pierre Mitto, technician in an industrial company was in company of two of his cousins, who remained anonymous, driving on the N631 road. Arriving at the locality "La Caiffé", they distinguished in the beams of the headlights two small characters of the size of an eleven-year-old child who crossed the road at some five meters in front of the car and which leaped in a pasture. Mr. Mitto applied the brakes and stopped twenty meters further. Hardly had they left left the car, that the three witnesses observed the departure of a large red-orange disc of approximately six meters diameter, at high speed, like literally "sucked" in the sky. Julien Gonzalez points out that an investigation was carried out by lieutenant Fayet and adjudant Vergne of the national gendarmerie; which allowed to find at the place indicated by the witness brownish spots of a viscous matter. The sources are given "Aimé Michel: 'À propos des Soucoupes Volantes', pages 193-194; C. Garreau et R. Lavier: 'Face aux Extra-Terrestres', page 162; Jimmy Guieu:' Black-Out sur les Soucoupes Volantes', page 199; Michel Carrouges: 'Les apparitions de Martiens', page 166; Michel Figuet et Jean-Louis Ruchon, 'OVNI, le premier dossier complet des rencontres rapprochées en France', page 139; Jean Sider, 'Le dossier 1954 et l'imposture rationaliste', page 191; Le Figaro du 13 octobre 1954." *Oct. 9, 1954 - Briatexte, France. At 8:30 p.m. on Route N631 at "La Caiffe," a technician named J. P. Mitto was returning from Toulouse with two other friends when they saw two small figures cross the road in front of their car and jump into a pasture. The beings were about the height of 11-year-old children and crossed only five meters in front of them. Stopping immediately, the witnesses saw a large convex disc take off vertically. It was about six meters in diameter, orange in color, and was literally "sucked up" into the sky. Brown oily spots were found at the landing site. (Source: Jacques Vallee, Passport to Magonia: A Century of Landings, p. 222, case # 222). After the observation, two parisian press journalists announced that they were the authors of a hoax, dressing up as Martians to denounce the gullibility of people reporting UFOs. The description of the saucer compared to fireworks is a good confirmation of this, since the two hoaxers used fireworks rockets to simulate the saucers. It so happens that the assertions of the two pranksters - journalists of Samedi-Soir offer at least one proof that they invented at least one of their mystification; this casting further doubt on the whole of their claims. As a matter of fact, they claim that they were the pranksters that fooled Mr Ott, in Toulouse. However, if Toulouse was indeed on their claimed route, the observation of Mr. Ott by no means took place in Toulouse in the South but in Mulhouse, in the East, in Alsace, almost at the other end of France! The mistrust of Michel Carrouges with regard to these claims of hoaxes by these journalists is thereby reinforced. Probably, or at least possibly the famous hoax by Parisian journalists Michel Agnelet and Pierre Laforêt. The credibility of the witnesses is not really the issue. The thesis of the journalists' prank is not a thesis that claims that "the witnesses are lying", it is thus not by stating that the witnesses are of good faith that it can be demonstrated that it was not a prank but a true flying saucer. The sighting conditions cannot have been "very good": it was at nightfall, from inside a car, at a place the witnesses were likely not familiar with since they were from the Paris area. The figures were seen in the car's headlights, and likey only for a very short time since the figues crossed the road "5 meters" in front of the driving car! The witnesses did not see "humanoids flying away in a flying saucer". They saw two figures cross the road, and some time later, they saw something luminous shoot up in the air. Nothing allows to consider certain that there were two humanoids in that something luminous. The "size" of the so-called "flying saucer" does not rest on anything solid. At night, people tend to provide "sizes" that are just interpretation. The distance is not established, the angular size is not established. The size thus does not have mor value than when witnesses say that a certain meteor was "10 meters wide". This size is nevertheless just as compatible with some "flying saucer diameter" than with the wize of the fireworks that the pranksters-journalists could have used. Brown oily stains at the location cannot qualify as "overwhelming proof" against the prank theory: the brown oily stains could just as well have been from the prankster's car, or anything else actually, nothing forces to consider they were oil that had dripped from a flying saucer. Lastly, the Press sometimes gave the "small detail" which should have make some ufologists think; which Figuet, Sider, etc overlooked or were unaware of: the thing is compared with fireworks... it is precisely what Michel Agnelet and Pierre Laforêt used to make believe at a start of a flying saucer. [---] Article in the regional newspaper Sud-Ouest, Bordeaux, France, October 9, 1954. [dm1] Article in the regional newspaper La Dépêche du Midi, France, October 12, 1954. [---] Article in the regional newspaper Dauphiné Libéré, France, October 12, 1954. [er1] Article in the regional newspaper L'Est Républicain, France, page 8, October 13, 1954. [---] Article in the regional newspaper La Liberté de l'Est France, October 13, 1954. [---] Article in the regional newspaper Paris Normandie, France, October 13, 1954. [lm1] Article in the regional newspaper Le Méridional, France, October 13, 1954. [lp1] Article in the regional newspaper Le Provençal, France, October 13, 1954. [---] Article in the national newspaper Paris-Presse, France, October 13, 1954. [---] Article in the national newspaper Le Figaro, France, October 13, 1954. [pr1] Article in an unidentified newspaper, France, October 14, 1954. [tl1] Article in the regional newspaper Le Tarn Libre, Albi, Tarn, France, France, October 15, 1954. [---] "Les Martiens, c'était nous", article by Michel Agnellet and Pierre Laforêt, in the magazine Samedi-Soir, Paris, France, week of October 21-27, 1954. [---] Article in the foreign newspaper Le Soir, Brussels, Belgium, October 22, 1954. [jg1] "Black Out sur les Soucoupes Volantes", book by Jimmy Guieu, Fleuve Noir publisher, France, 1956. [jg2] "Black-Out Sur Les Soucoupes Volantes", book by Jimmy Guieu, Fleuve Noir publisher, France, 1956. [am1] "Mystérieux Objets Célestes", book by Aimé Michel, Seghers publisher, France, pp 211-212, 1958. [mc1] "Les Apparitions de Martiens", book by Michel Carrouges, (aka Louis Couturier), Fayard publisher, France, page 104, page 80, pp 163-165, 1963. [---] "Piece for a Jig-Saw", book by Leonard G. Cramp, Somerton publisher, U-K., 1966. [jg1] "Black Out sur les Soucoupes Volantes", book by Jimmy Guieu, Omnium Littéraire publisher, France, pp 205-206, 1972. [jg2] "Black-Out Sur Les Soucoupes Volantes", book by Jimmy Guieu, Omnium Littéraire publisher, France, page 199, 1972. [am1] "A Propos des Soucoupes Volantes", book by Aimé Michel, reprint of "Mystérieux Objets Célestes", Planète publisher, France, pp 193-194, 1972. [tp1] "Physical Traces - Material Evidence of UFO's? ", article vy Ted Phillips, in the ufology magazine Skylook, Mutual UFO Network, USA, #60, page 12, November 1972. [jv2] Summary by Jacques Vallée in "En Quête des Humanoïdes", book by Charles Bowen, French translation of "The Humanoids", J'ai Lu publisher, France, page 47, 1974. [---] "Physical Traces Associated with UFO Sightings", compiled by Ted Phillips, CUFOS, USA, 1975. [gl1] "Face aux Extra-Terrestres", book by Charles Garreau and Raymond Lavier, Delarge publisher, J'ai Lu, France, page 163, 1975. [bb1] "La Grande Peur Martienne", book by Gérard Barthel and Jacques Brucker, Les Nouvelles Editions Rationalistes publishers, France, pp 93-94,97, 1979. [ez1] "Les Apparitions d'Humanoïdes", book by Erich Zuercher, Alain Lefeuvre publisher, France, pp 179, 181, 1979. [gc1] "UFOs and Anti-Gravity: Piece for a Jigsaw", book by Leonard G. Cramp, Adventures Unlimited Press publishers, U-K., page 128, 1997. [dg1] "Dans le Tarn... la grande vague de l'automne 1954", article by Didier Gomez, France, was on the Web, May 2004. [bu1] "Ces Etranges Déchêts Laissés par les OVNIS...", article by Claude Burkel, in the sensation magazine Top Secret, France, #20, page 25, 2005. [jg3] "RR3 - Le Dossier des Rencontres du Troisième Type en France", book by Julien Gonzalez, Le Temps Présent publishers, France, pp 121-122, 2014. 1.0 Patrick Gross March 9, 2009 Conversion from HTML to XHTML Strict. First formal version. Additions [jg1], [go1], [dj1], [dg1], [jb1], [tp1], [lc1], [ud1]. 1.1 Patrick Gross April 23, 2009 Addition [bb1]. 1.2 Patrick Gross March 7, 2010 Addition [gc1]. 1.3 Patrick Gross March 13, 2010 Addition [jg2]. 1.4 Patrick Gross June 28, 2010 Addition [jv5]. 1.6 Patrick Gross September 21, 2014 Additions [ha1], [ni1], [ta1]. 1.7 Patrick Gross November 20, 2016 Additions [er1], [ub1]. 1.8 Patrick Gross December 13, 2016 Additions [fs1], [js1], [jg3]. In the explanations, addition of the paragraph "Lastly, the Press..."
1.9 Patrick Gross January 5, 2017 Addition [pr1].